My nephew Matt Parker is a loyal reader and contributor to Johngy's Beat. He is always alert for a Friendly Encounter. We have previously seen his girlfriend Erin Galligan on Friendly Encounters with her family and Ozzie Guillen of the Chicago White Sox. It has taken a while, but we finally got Erin to make another appearance here. Matt and Erin recently attended a performance of the Blue Man Group. They enjoyed the show and thankfully did not don the blue face paint themselves (although maybe Matt might want to consider it...oh just kidding, Big Money). 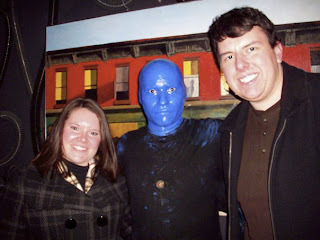 Anyway, after the performance, Matt and Erin made sure to grab a photo with one of the Blue Men. Which one, I wonder? I am sure their goal was a 'couple' appearance on Friendly Encounters (as opposed to a nice memento of a wonderful evening). Hey, they have their priorities right! I hope they enjoy this piece. If not, I guess I'd be left to feel blue (sorry I just couldn't stop myself). Erin Galligan, Blue Man and Matt Parker in IL-January 2010.